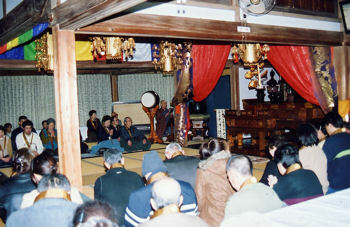 The religion of this temple is Soto sect. 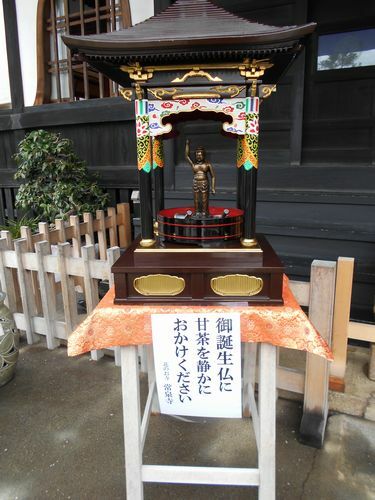 Its head temples are Eiheiji in Fukui Prefecture and Sojiji in Yokohama. 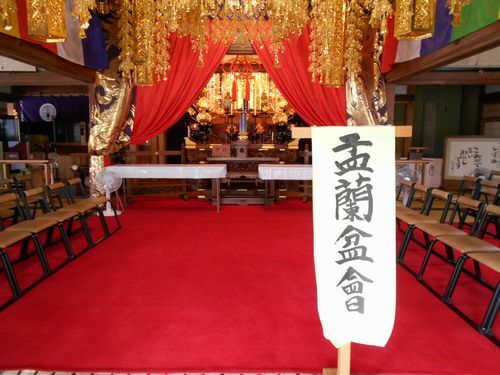 This temple is said to have been founded in 1588 (Tensho era 16 years). The current chief priest is the 24th generation. The principal image of this temple is wooden Sho Kanzeon Bosatsu (Kwannon, Sacred Avalokitesvara, Goddess of Mercy Bodhisattva). The image is said to have been created in Edo era. The construction of the present main hall was completed in 1932. The previous hall, a grand thatched building, was burned down by the Great Kanto Earthquake in 1923. It is believed that the principal image and the dais of the Buddhist image were saved by the rafters as the whole roof fell down to the ground without breaking. This temple is well-known and familiar with flowers and Kappa(*). Flowers bloom throughout the year. 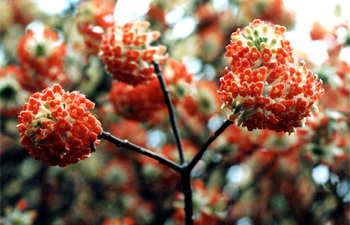 Particularly "Mitsumata" (Edgeworthia chrysantha) in spring and white "Higanbana" (Lycoris radiate) in autumn are famous. "Mitsumata" is selected as one of the 100 sights of flowers in Kanagawa Prefecture. 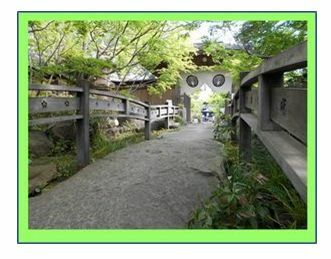 Many images of Kappa are placed in the garden so that visitors may enjoy the sceneries with flowers. Kappa is said to be orginated in the upstream of the Yellow River or Huang Ho in China. Its old name was "Suiko" (warter tiger) or "Kahaku" (stay in the River). It is considered that these expressions were introduced to Japan and changed to Kappa. Kappa, as the spirit of water or Suijin (water deity), symbolizes various religious faiths, which is the source of saying that Kappa was born from a drop of Suijin. In early days there was a place where water welled out on the grounds, and the name of the temple is "Seiryuzan Jousenji" (temple of everlasting spring on the clear stream mountain). Thus the temple is closely related to water, and so Kappa is deified here. 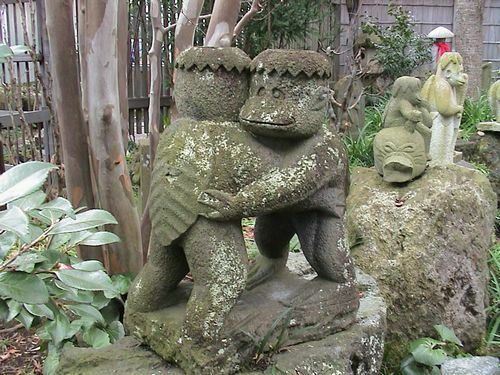 There are more than 300 images of Kappa in the garden. The chief priest has put Kappa images, wishing that they may soothe visitors' hearts on behalf of himself who is not always able to meet every one of the visitors. 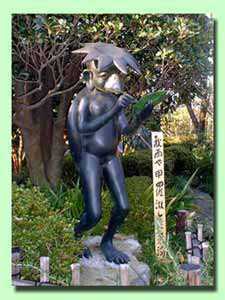 (*)Kappa: Known as a Yokai demon or imp found in traditional Japanese folklore. The name is a combination of the words "Kawa" (river) and "Wappa" (child). In Shinto they are considered to be one of many Suijin (water deity). Every person and thing is linked to one another by a fate in this world; persons and persons, persons and things, things and things, work, love, study, health, families, children, friends, superiors and subordinates at work, and so on. The matchmaking Bodhisattva gives these relationships. After having prayed to Bodhisattva in accordance with the manners, make your own efforts. Thanks to this kind of relationship, you visit the Jousenji temple today. Keep this relationship and live your life well. Using tripod or monopod is not allowed. Bringing any kind of pets is not allowed. Drinking alcohol and smoking are not allowed. Approximately 7 minutes' walk from Kozashibuya Station of Odakyu-Enoshima Line. on R246, or about 40 minutes' ride from Shimo-Kawai interchange on R16. In our garden there grows a Japanese white pine named Goyomatsu estimated 650 years old, which dated back to1366 in the Muromachi Shogunate era. 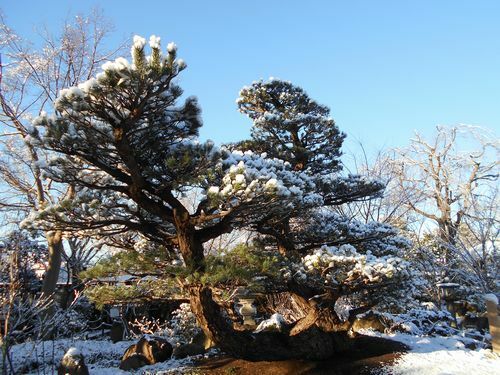 This tree grew naturally in a mountain in Nagasaki and was jointly managed by Kubota Shouryokuen garden center in Nagasaki prefecture and Toshinori Suzuki of Daijyuen garden center in Aichi prefecture. 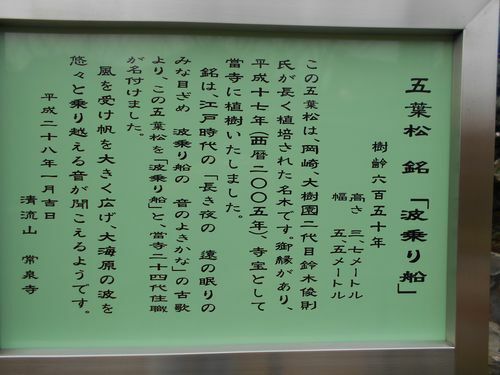 The tree was once moved to Daijyuen garden center and transplanted back to Nagasaki in 2000. 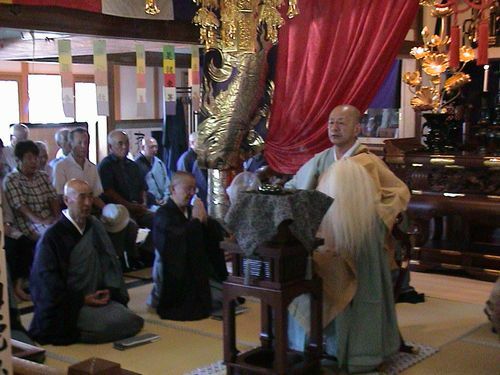 In 2005, the tree was transferred to this temple by sea in relationship to Kentarou Shiino, the Houjuen garden center nurseryman who practiced ascetic training in Daijyuen garden center. (Awakening from deep sleep in a long night, soothing sounds of a boat sailing on waves). At the mercy of fate, the pine tree has settled down in this temple as a place of living in peace. It looks like a boat sailing over big waves with full sails in the wind in the ocean.